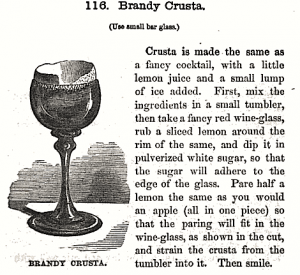 The Brandy Crusta is a classic cocktail with no compare. It can also be made with gin or other spirits, but Brandy is a personal favorite. Here’s how to make a Brandy Crusta, based on an adaptation from Jerry Thomas’ famous instructions. In a mixing glass or a cocktail shakre, mix the lemon juice, simple syrup, brandy and curacoa. Stir well. In a tumbler or cocktail glass, moisten the rim of the glass with lemon and dip in sugar. Peel a lemon in a 3 – 5 inch strand and set the length of the peel inside the glass, along the rim, so that it lines the entire glass. Strain in the cocktail mixture, and as Jerry Thomas advises, smile. His directions, with an illustration, are below. Enjoy!